In a previous post, we described a style of altar commonly known as The English Altar. 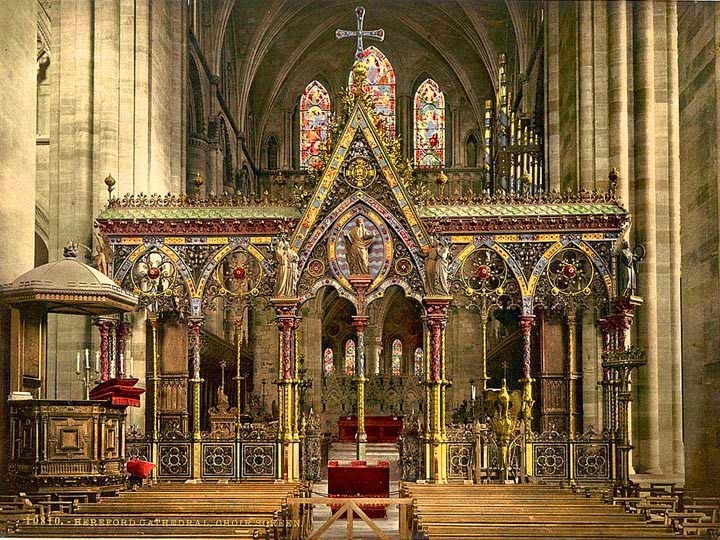 As the name would suggest such altars developed into a particular style in England, although since the nineteenth century they have come to spread to other parts of the English-speaking world. 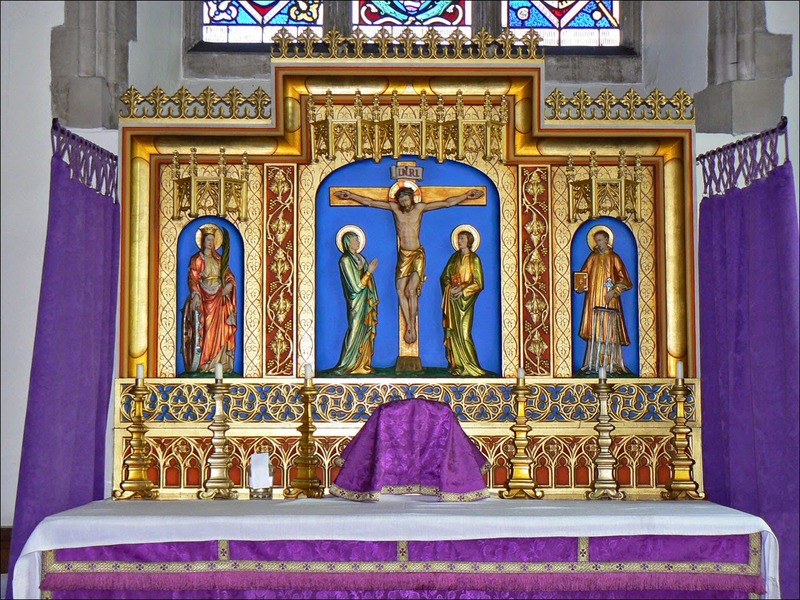 The form of reredos complementing the English Altar falls into two principal varieties : (a) a dossal or curtain of rich fabric, suspended from a railing and carried around three sides of the altar; (b) a low wall which is either of painted timber or carved from stone (or an admixture of the two). 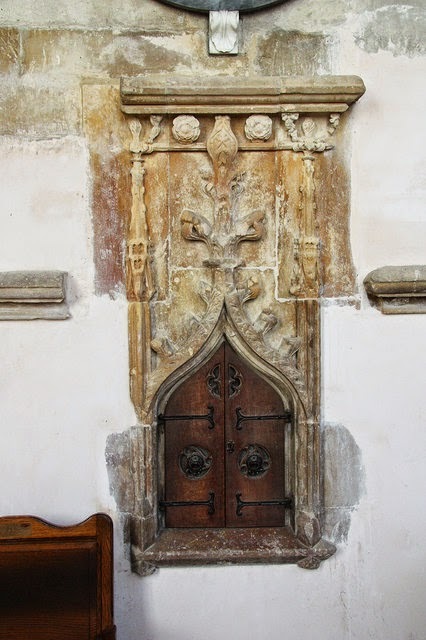 In this post, we are pleased to discuss an English altar of the second variety and, indeed, one built in very recent years. succeeds in improving its proportions. but happily is usually covered with an antependium. 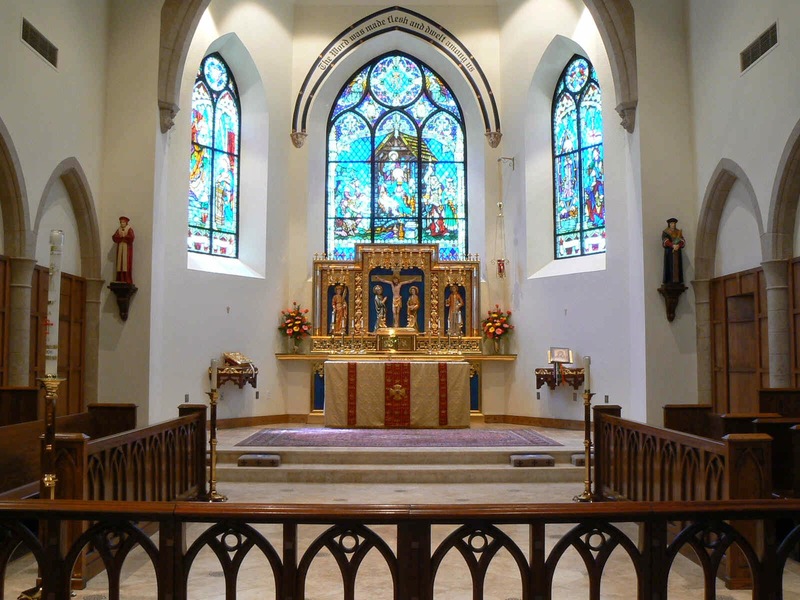 This is the High Altar found in the Church of Our Lady of Walsingham in Houston (Texas, USA), a building conceived and built in a very simply Gothic idiom as recently as 2003. The church was designed by the architectural firm of Cram and Ferguson. The High Altar of this church is a near-replica of the altar in the Slipper Chapel, being the Shrine of Our Lady of Walsingham in the United Kingdom. The work of reproducing this reredos in Texas was given to the Spanish firm of Granda Liturgical Arts, and is of the highest quality. It is a welcome relief from their usual Spanish oeuvre. 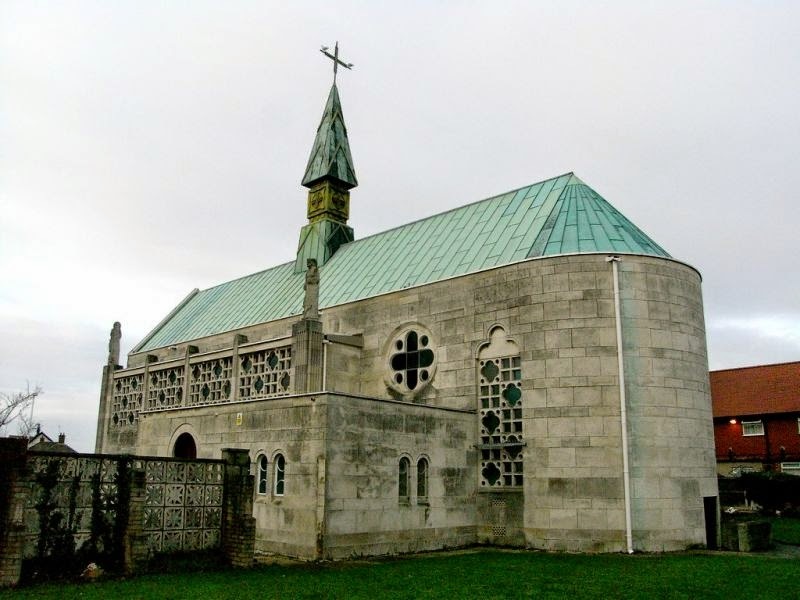 The English shrine of Our Lady of Walsingham was founded in the eleventh century. Walsingham became a renowned place of pilgrimage in England - second only to Canterbury Cathedral. Although several kings and queens of England, Scotland and France had made the pilgrimage, this did not prevent the Shrine being despoiled and brought to ruin by the vile King Henry VIII. Towards the end of the nineteenth century, a building used as a barn was discovered to be the original Walsingham Shrine. It was rebuilt and restored to religious use through the efforts of a devout woman, Charlotte Boyd. 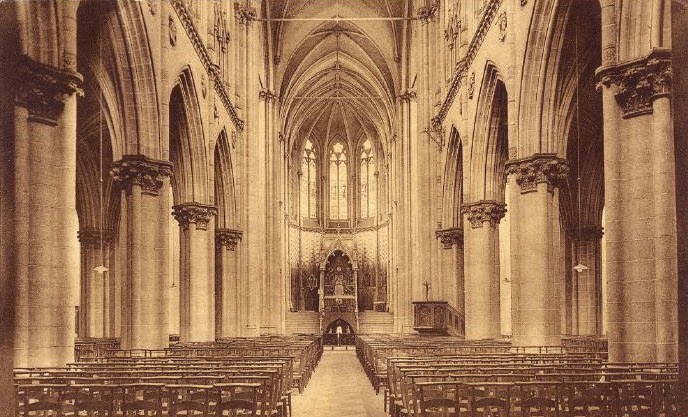 In 1934, the first Mass was celebrated in the Chapel in more than four centuries. 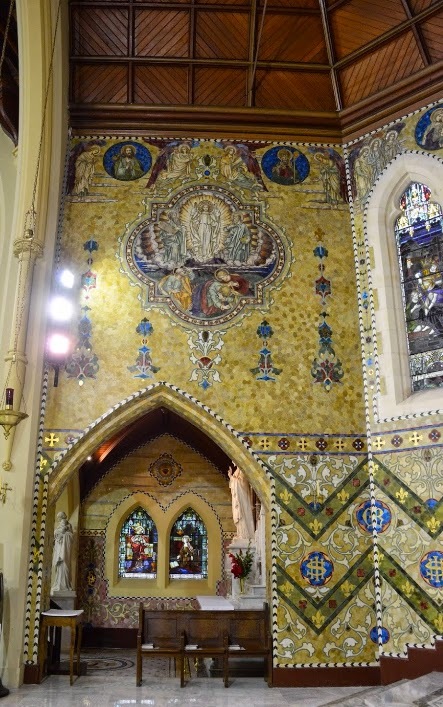 The altar in the chapel was designed and built in the early twentieth century by a local artisan named Lilian Dagless. 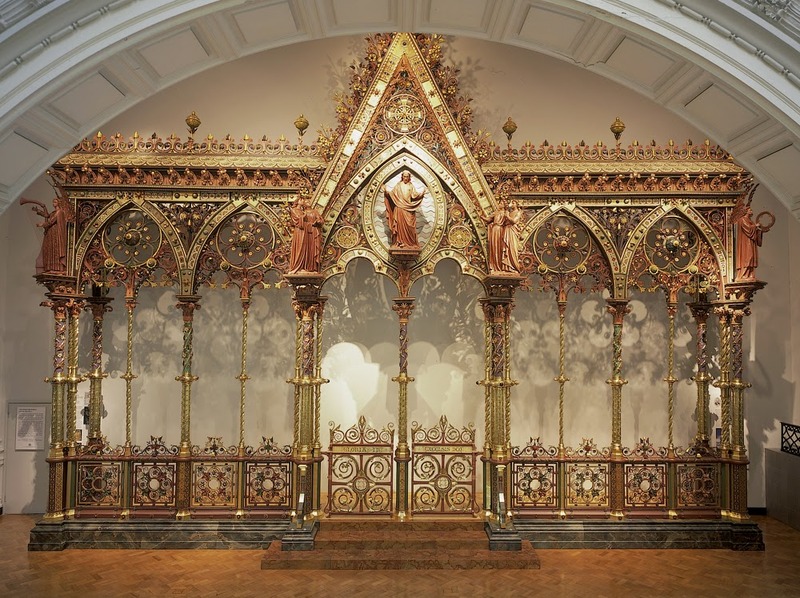 It is an interpretation of the form of reredos commonly found in England until the time of the Reformation. A carved bas-relief of the Crucifixion with Our Lady and S' John is the central scene of the reredos; on either side there are reliefs of the martyrs S' Catherine of Alexandria and S' Lawrence carrying the instruments of their martyrdom. All of these bas-reliefs are crowned by slightly-projecting canopies of Gothic tracery. Blue and red polychrome, highlighted with gold gilding, completes the ornament of this wonderful work. in the Shrine of Our Lady of Walsingham, England. but has an additional arcade of tracery at its base. The cresting along the top of this reredos is also more robust than in Houston. and that the not-very-large tabernacle is fittingly veiled. the Church of Our Lady of Walsingham, Houston. 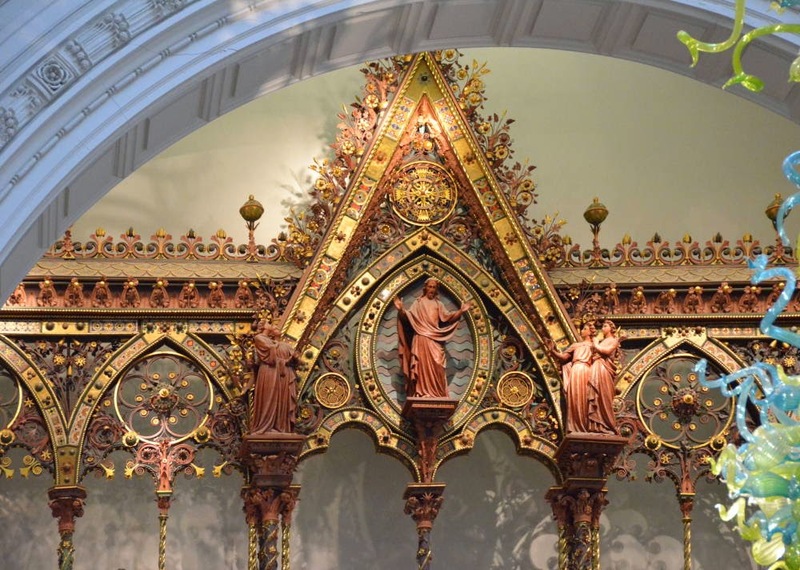 so that it becomes visually central and not over-powered by the gilded reredos. are infelicitous later accretions and detract visually from its aesthetics. 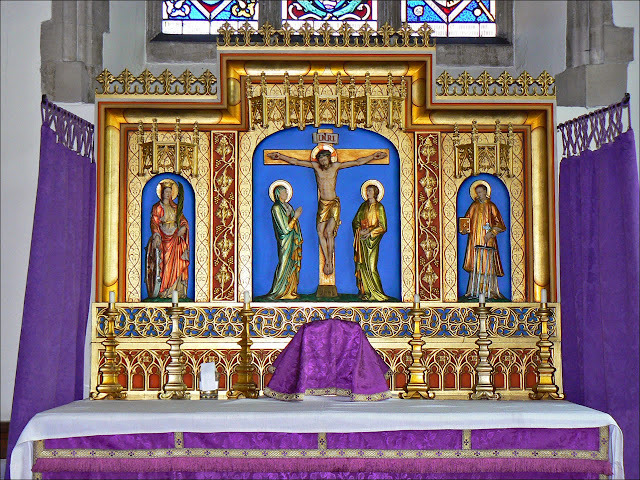 Despite Mass usually being offered ad orientem in the Church of Our Lady of Walsingham, the altar is detached from the reredos and therefore is free-standing. It is possible for Mass to be offered versus populum at this altar. Here is another example of how a flexible approach to the General Instructions on the Roman Missal can result in a suitable setting for the celebration of the Sacred Liturgy which respects both aesthetics and liturgical principles. The Cardinal-Archbishop of Galveston-Houston offering Mass at the High Altar. The altar is so beautiful, why would we cover it up? It is too difficult to be changing frontals frequently. The answers to the first objection may be found by re-reading our first post. But in this article we wish to begin to discuss the second objection. clothing the High Altar of Westminster Cathedral (UK). shewn in the photograph offering Mass. Firstly, some terminology. The words frontal and antependium presuppose that the covering is applied only to one face of the altar namely, the front of it. This is perfectly proper when considering an altar which is attached to a reredos, or very close to a wall and therefore not freestanding. 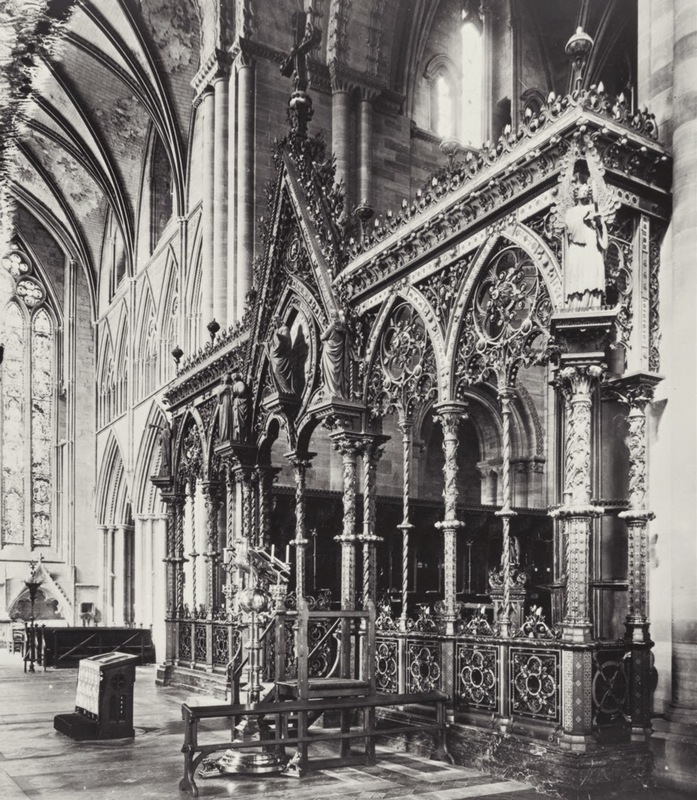 An altar, however, is a three-dimensional structure and - if it is freestanding - it ought to be fully clothed, not just clothed on those sides which are generally visible. 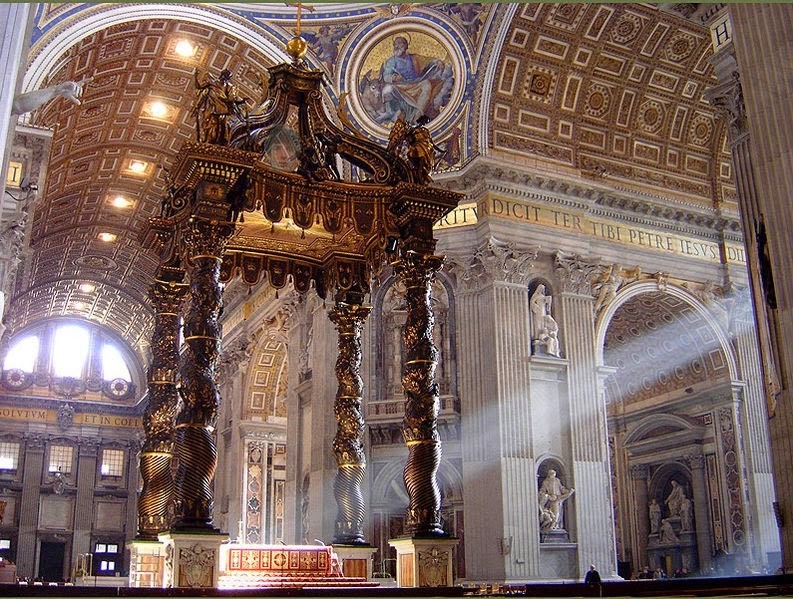 Consequently, we also find the term altar pall which describes a parament which covers all sides of the altar or, at the least, two of them, the front face and the back face. A free-standing altar placed in a central position which can be viewed from all sides, requires coverings at the front and the back (we leave aside the question of the linen altar cloths) in order for the covering to fulfil its purpose. It is unseemly to cover the front and not the back of an altar, unless of course, one takes the view that the altar frontal is purely used for aesthetic effect. 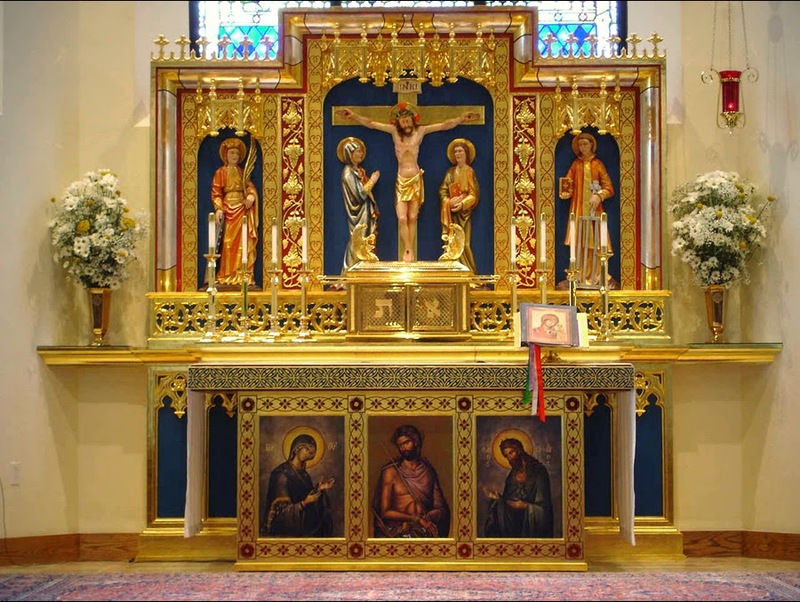 Where possible, and for reasons of adequately expressing sacred symbolism, the altar pall or frontal ought to be changed in accordance with the colour of the Liturgical Day or Season. It is quite acceptable, however, to have a worthy form of altar pall which is changed hardly ever. It is when several frontals or palls are used and have to be changed that the second objection becomes more prominent. At present, as in the past, very few altars are designed with any thought given to their being covered with a pall or frontal. This is a serious deficiency in the vision of designers, but it is hardly a new one. It is very important when designing altars that serious consideration is given as to how they will be clothed. If no arrangement, or a clumsy arrangement is made for clothing an altar with a pall, quite quickly this will be cited as the reason NOT to use an altar pall or frontal. "It's too much trouble". We will pass over without comment those execrable and unbefitting creations which, being multi-sided instead of four-sided, arrogantly defy sacred Tradition and any form of altar covering. Abbey-Church of the Holy Trinity, Lessay (Normandy). A magnificent expression of Romanesque. Dotted across Europe are so many churches which are, or have been, attached to religious houses. This post concerns one such church which is almost a thousand years old attached to a former Benedictine Abbey in Normandy, France. 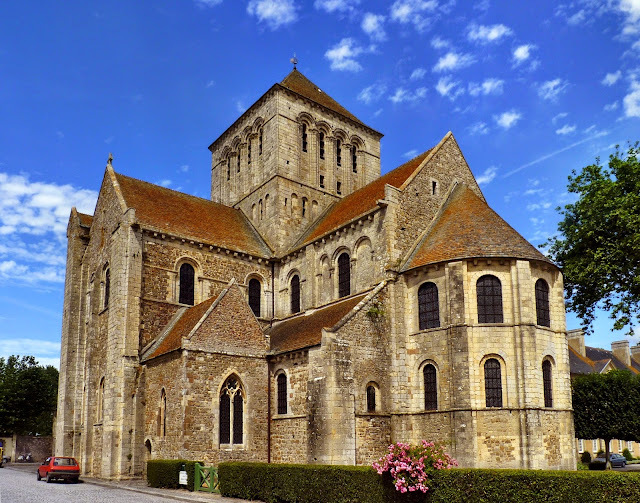 The following description of the Abbey-Church of Sainte-Trinité (Holy Trinity) in Lessay, Normandy (France) is adapted from a brief essay found at this link. 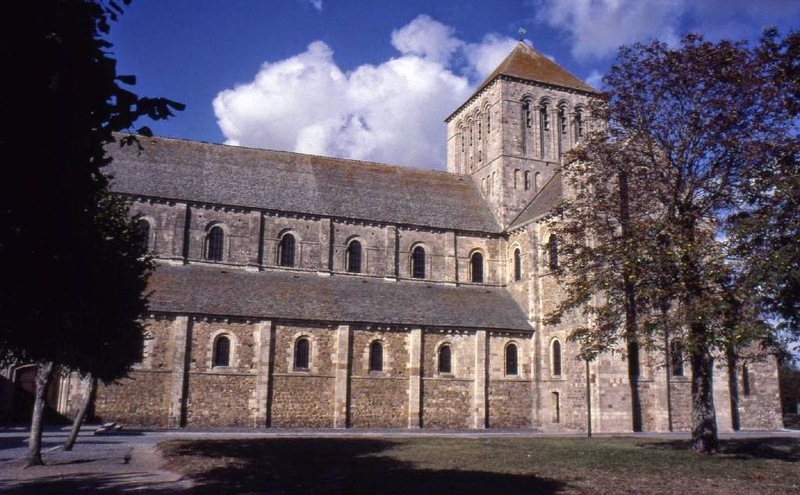 This Benedictine Abbey was founded around 1056. By 1098 the choir of the abbey church had already been built and the nave was built in the first years of the twelfth century. The church was consecrated in 1178, but it was not fully completed at that date. 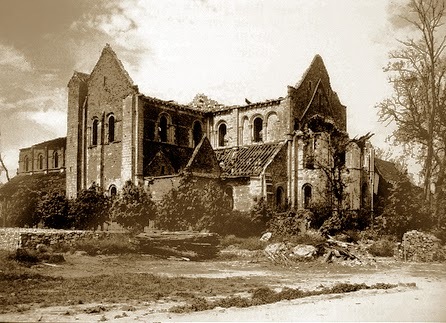 It continued as a monastery until the French Revolution but became a Parish Church at that time, the monastery buildings passing into private hands. 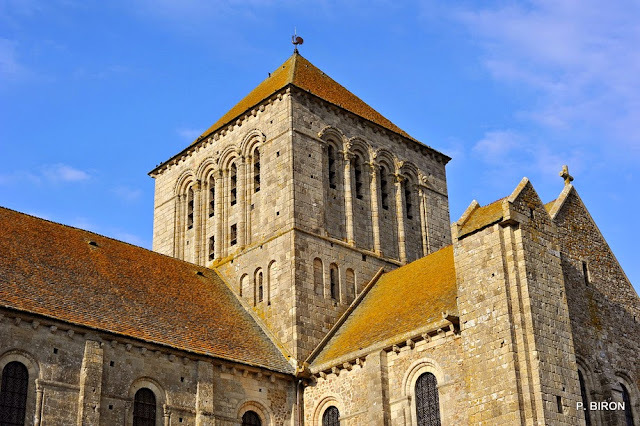 The Benedictine plan in the form of a Latin cross is used in most of the large abbey churches of Normandy: apse with chapels to scale, abutting the aisles and the arms of the transept, and a long nave with aisles. The interior elevation is that of the Norman Romanesque churches : large arcades, an intermediate level of tribunes and high windows. 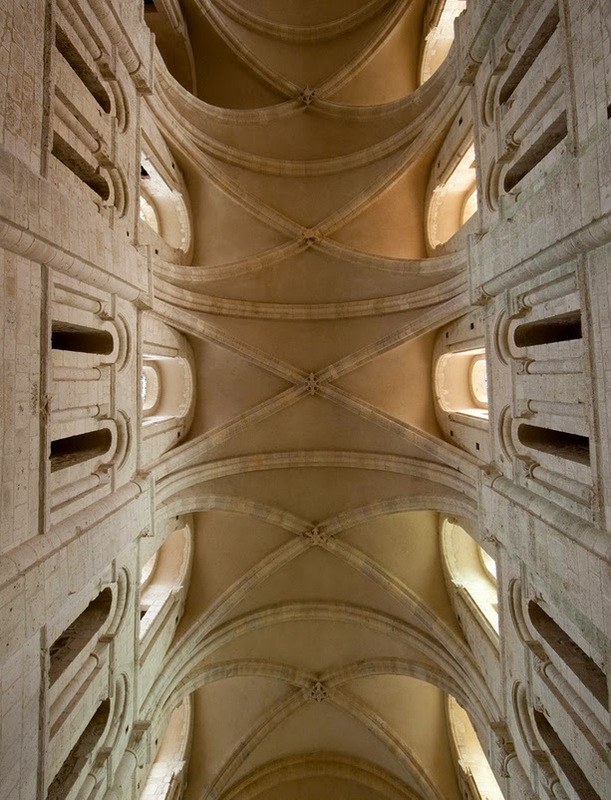 The Lessay Abbey-Church features ceilings of tracery vaults : one of the earliest examples of such vaults and well before the development of rib vaults in Gothic architecture. 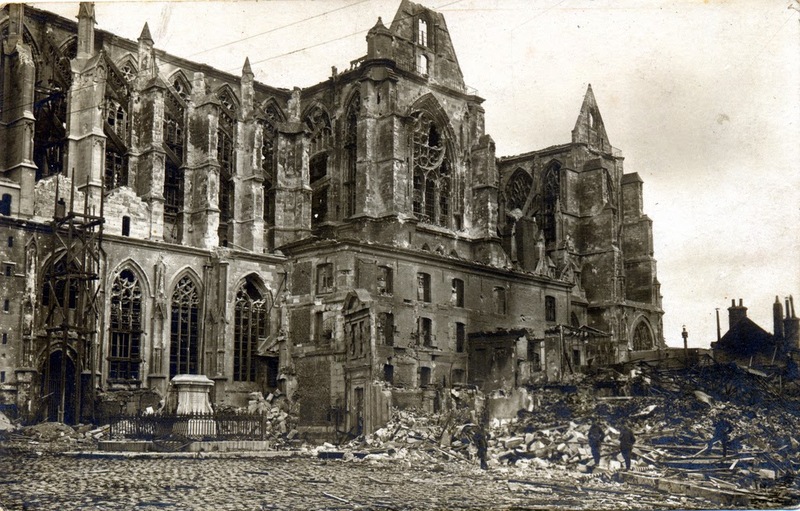 The church was almost totally destroyed on two occasions by war. 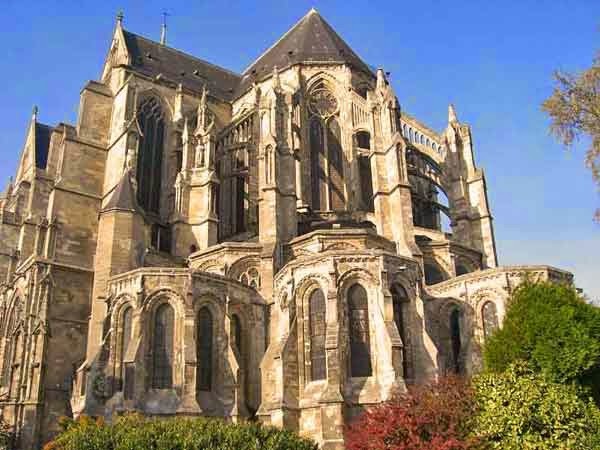 In 1356 during the Hundred Years' War, Charles II of Navarre directed his army to destroy the Abbey and Church. The church was reconstructed between 1385 and 1420. 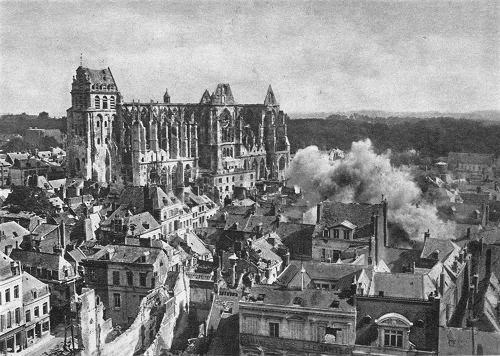 In July, 1944, the German army, retreating after the D-Day Landing, blew-up the church, reducing large parts of it to piles of rubble. 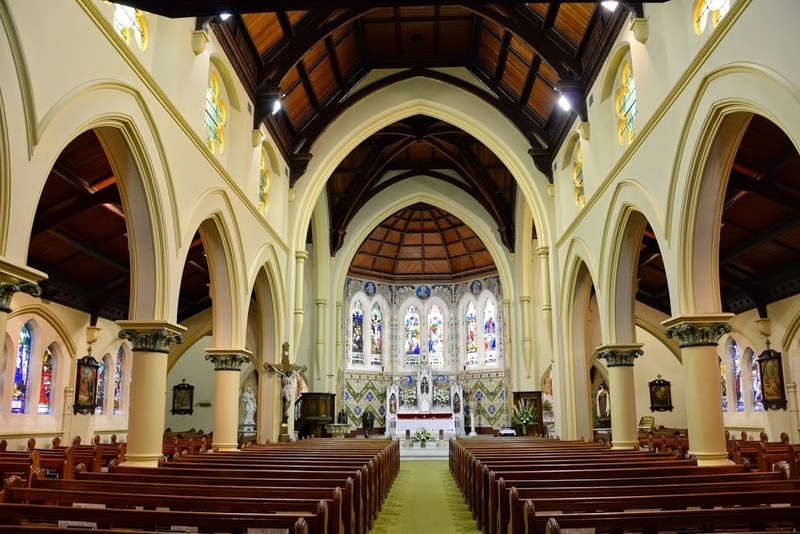 It was reconstructed with the greatest care and fidelity in the period 1945-1958 and continues to serve as a Parish church. 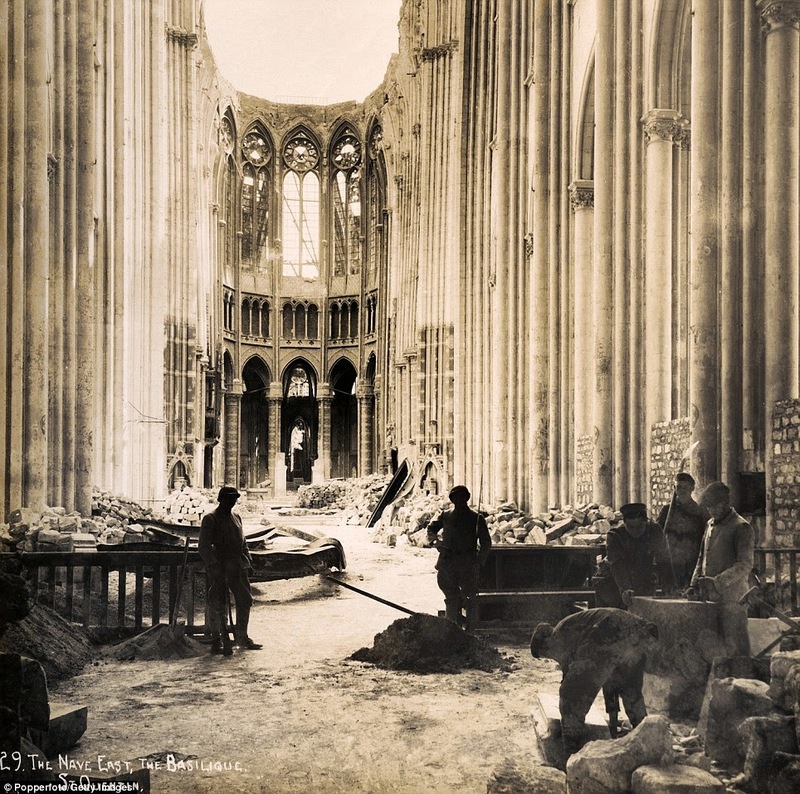 A more detailed history of the Abbey can be found here . Nave and south transept, with the Crossing tower. pierced by arcading and crowned with a pyramidal roof. reconstructed faithfully after World War Two. a perfect expression of the monumental and noble art of the Romanesque period. easily removable without injury to the building. another sad victim of war. because of its portland stone exterior. 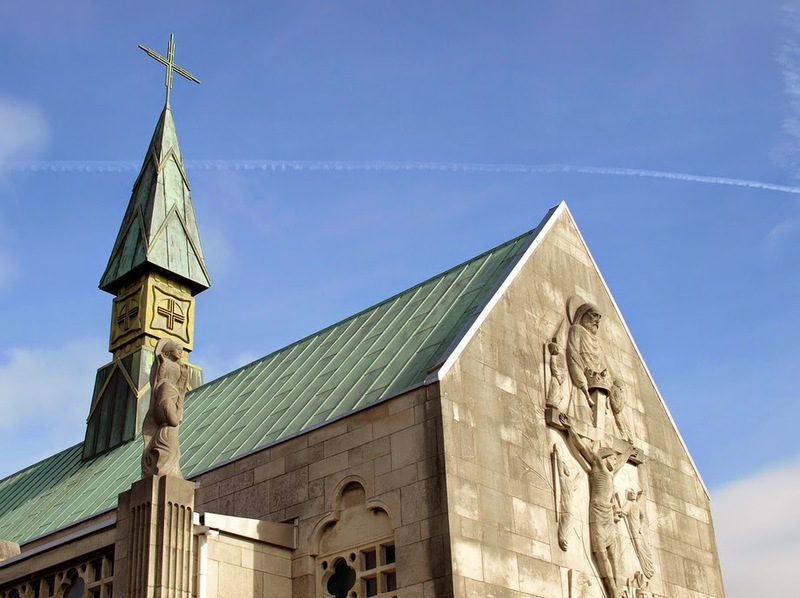 The former shrine-church of our Lady of Lourdes in Blackpool was built between 1955 and 1957 to a design by the Catholic architect Francis Xavier Verlarde. During World War II, the Bishop of Lancaster, Thomas E. Flynn, sought the intercession of the Blessed Virgin, to protect the Diocese from war damage. 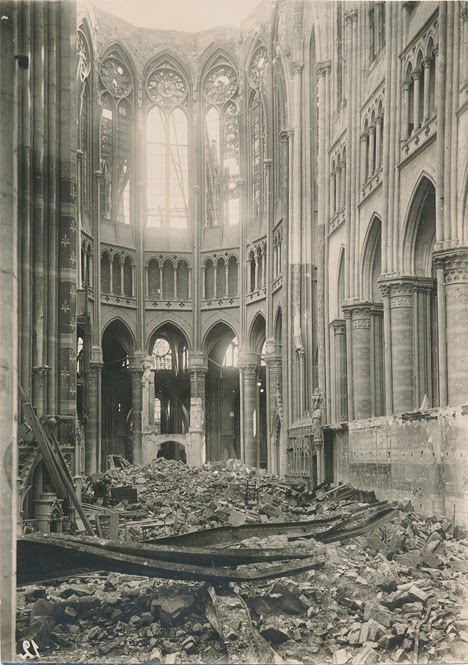 At the end of the war the Diocese had been relatively undamaged, and the bishop conceived the idea of building a shrine to Our of Lourdes in thanksgiving. 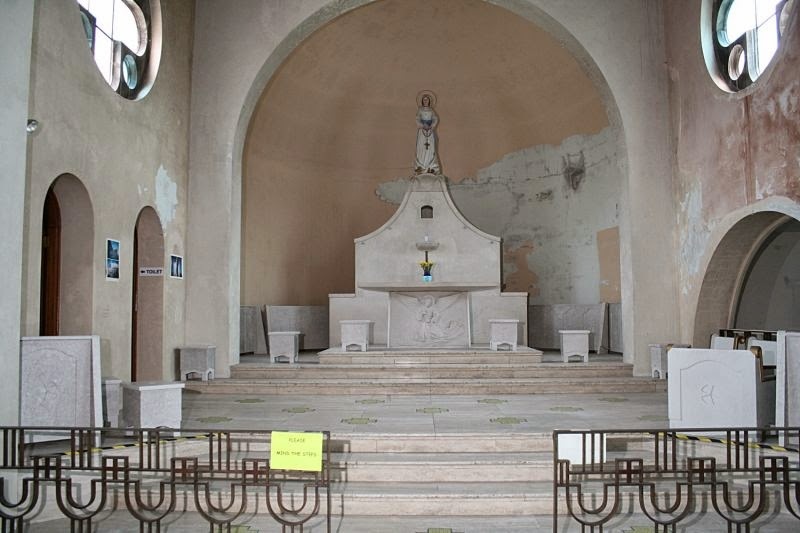 The churches designed by the architect Verlarde were decidedly modern in appearance. 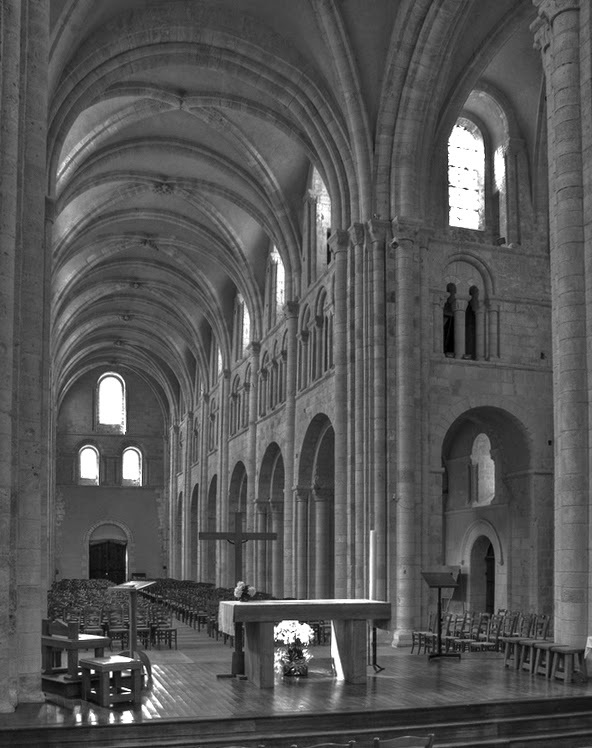 He designed relatively simple churches in a style derived from the Romanesque churches of rural France but in a greatly simplified, even severe form. It would not be correct to describe his work at art deco, but nevertheless they blend with the streamlined architecture of that period. The Blackpool shrine was built towards the end of Verlarde's life. shewing the tracery windows of the aisles. 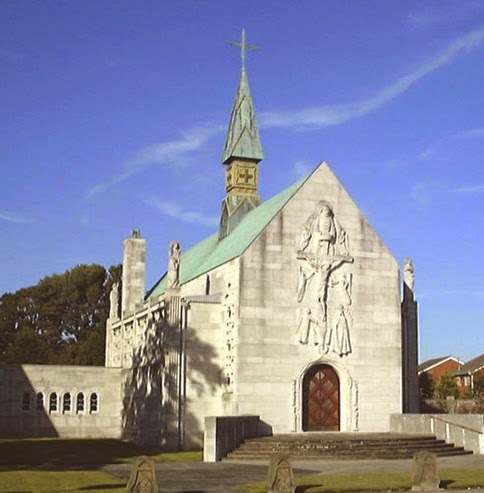 Wikipedia tells us that shrine-church of our Lady of Lourdes is constructed in brick and concrete clad with Portland stone. 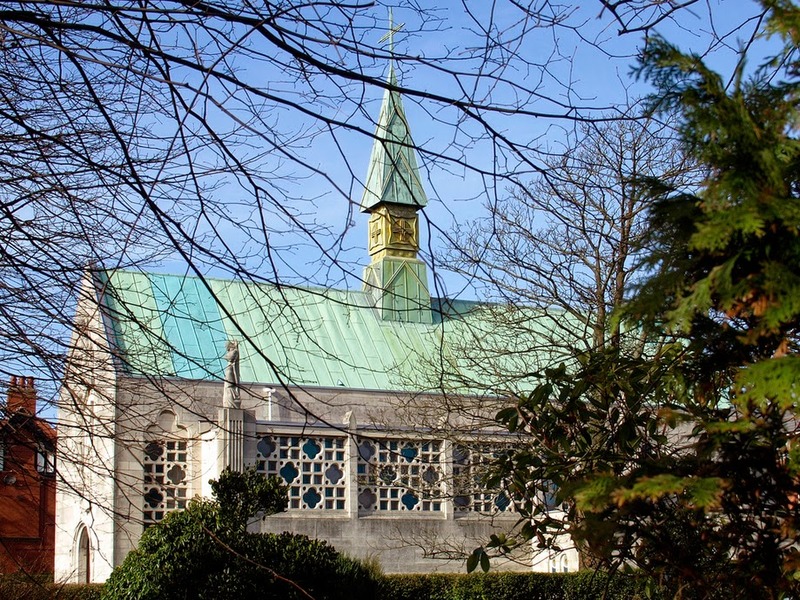 The church is roofed in copper sheets and has copper cladding to the flèche or spirelet. The nave is flanked by box-like aisles in which rectangular panels of cast concrete glazing are filled with geometric patterns, their pink and pale blue glass giving good light to the interior. At the west end there is single-bay narthex, and at the east end is an apse forming the sanctuary, and projecting vestries. The exterior of the church is decorated in a most striking manner with marvellous stone carvings by David John. In the west front over the fine timber double doors is a bas-relief of the Crucified Christ surrounded by the angels. God the Father is depicted above the Cross and the Blessed Virgin at its foot. 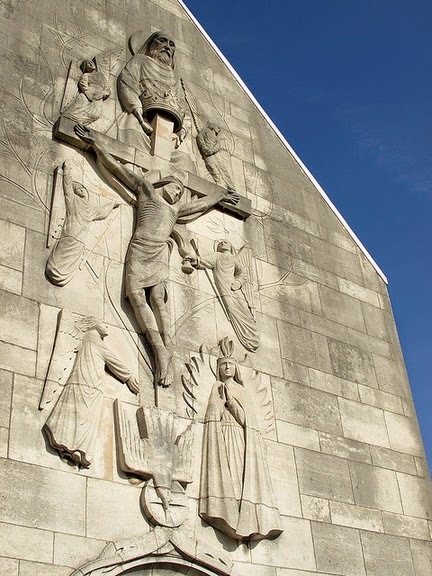 David John also designed the pinnacles at the corners of the building; these depict Our Lady of Lourdes appearing to Saint Bernadette, Christ appearing to Saint Margaret Mary, Saint Thomas of Canterbury, and Saint Edward the Confessor. At the entrance to the building are York stone steps with splayed flanking walls. The interior arcades columns are clad in gold mosaic. The ceiling is coloured blue, red and gold, with deep coffering around the light fittings and the floor of the body of the shrine is tiled. The sanctuary is raised and approached on marble steps through a round arch; its floor is travertine with mosaic panels. 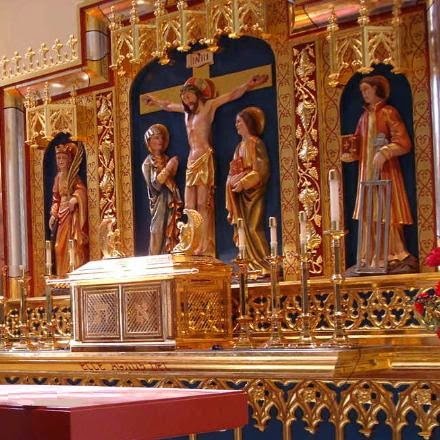 The altar rails are bronze with an Art Deco design. The altar reredos was carved by David John. 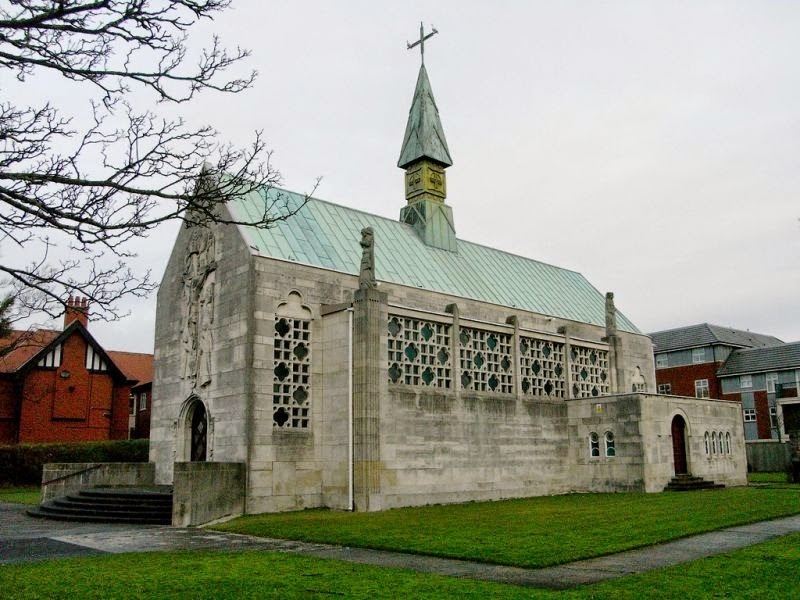 Unhappily, the shrine was deconsecrated in 1993, and passed into the ownership of the Historic Chapels Trust (a secular charity), in 2000 in a poor state and without an endowment. 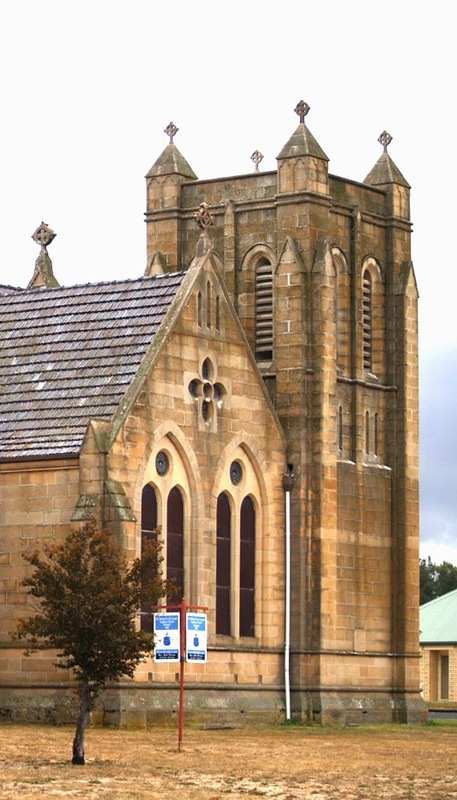 Several recent photographs of the exterior of the church may be found here. in juxtaposition to the spirelet on the nave roof. Note the clean - almost severe - lines of the apse. Another view, from the southwest. are part of the original design but greatly detract from the building. 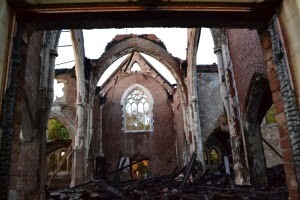 The now derelict interior of the Shrine Church is partially shewn in this photograph. is part of the original sanctuary furnishings. The austere and oddly-shaped reredos is a great disappointment. 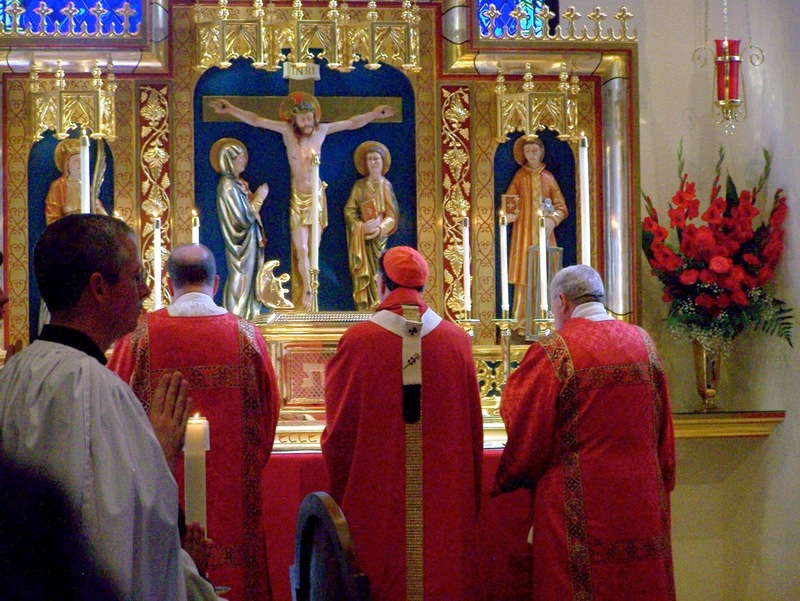 Although reservation of the Blessed Sacrament is of great antiquity in the practice of the Church, the oldest and primary purpose of reservation is formally stated in the 13th canon of the Council of Nicaea (AD 325) : "With respect to the dying, the old rule of the Church should continue to be observed which forbids that anyone who is on the point of death should be deprived of the last and most necessary Viaticum." In this post, we wish briefly to trace the manner of reserving the Blessed Sacrament in the Western Church. This pyx was designed to be suspended above an altar. In the Collection of the Boston Museum of Fine Arts. 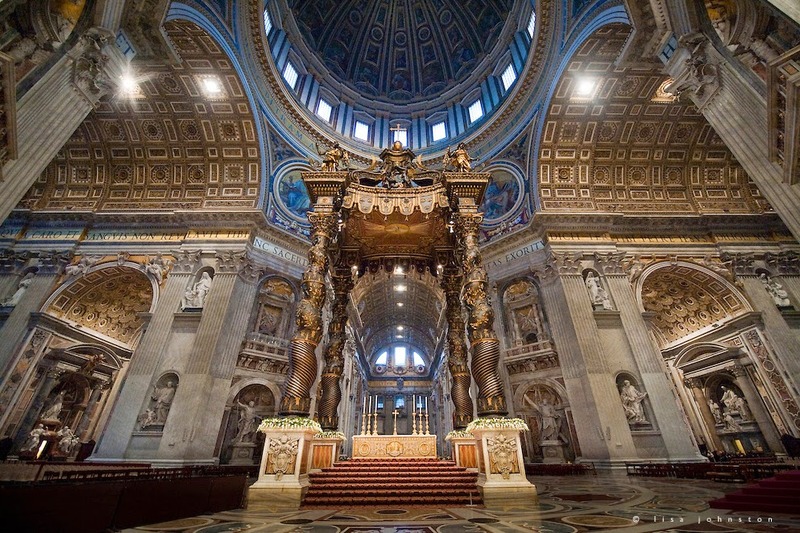 The first official regulation for reservation in the Western Church comes from the Fourth Lateran Council of 1215, when it was already the custom to reserve the Blessed Sacrament in cathedrals, parish churches and the chapels of religious orders on (or more usually) near the altar. The Council did no more than direct that the Reserved Sacrament should be kept with strict care under lock and key. There appears to be no reliable evidence before the year 1000, or even later, the Blessed Sacrament was kept in churches in order that the faithful might visit it or pray before it. As to the manner and place of Reservation during the early centuries there was no great uniformity of practice. In the early mediaeval period, caskets in the form of a dove or of a small tower made for the most part of one of the precious metals, were commonly used for the purpose, but whether in this period these Eucharistic vessels were kept over the altar, or elsewhere in the church or in the sacristy is not clear. 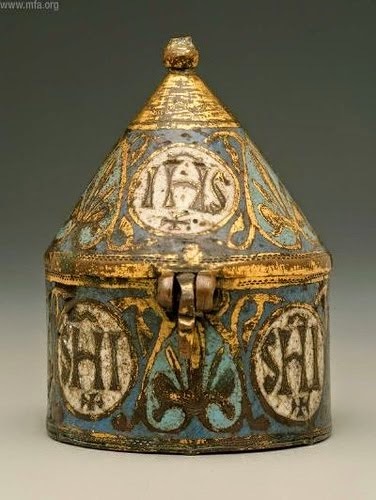 But after the tenth century the most common usage in England and France seems to have been to suspend the Blessed Sacrament in a pyx or dove-shaped vessel over the High Altar. Nevertheless, fixed and locked aumbries were also found. Rheine, Germany, late 15th century. is located just outside the sanctuary in the northern transept. 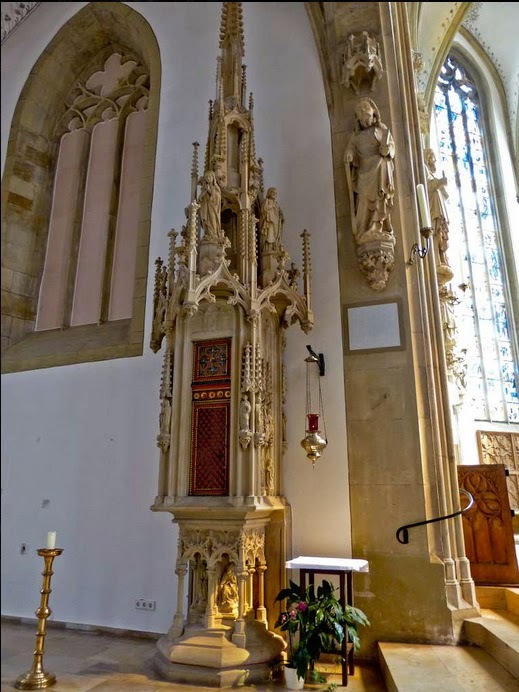 Germany and the Low Countries developed the Sacrament House, an elaborate structure of stone and metalwork, usually standing a short distance away from the altar on the northern or Gospel side of the sanctuary. 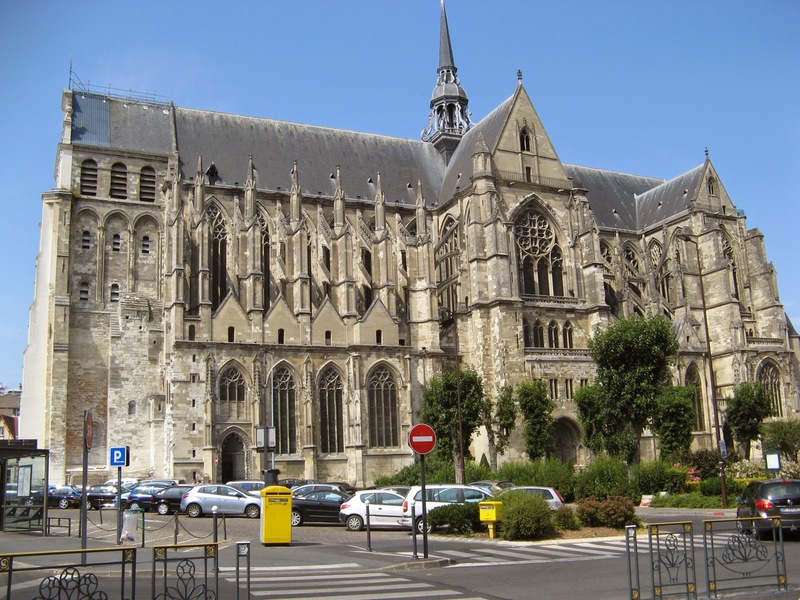 is enriched with stonework in the Decorated Gothic style. A cupboard or Aumbry in the wall of the sanctuary was customary in parts of Italy, Portugal, Sweden, Scotland and elsewhere. They were most frequently enriched with stonework and polychrome work. The reforms following the Council of Trent (1545 - 1563) prescribed a Tabernacle fixed to the centre of the altar. But earlier usages were not formally forbidden. Furthermore, specific Chapels for the reservation of the Blessed Eucharist were arranged in Cathedrals and Greater Churches, separate from the Sanctuary. After Trent, the tabernacle became the usual mode of reservation in all Catholic churches, although there were exceptions in Germany and Belgium, where the old sacrament houses were permitted to be used. which resembled miniature temples in the classical style. 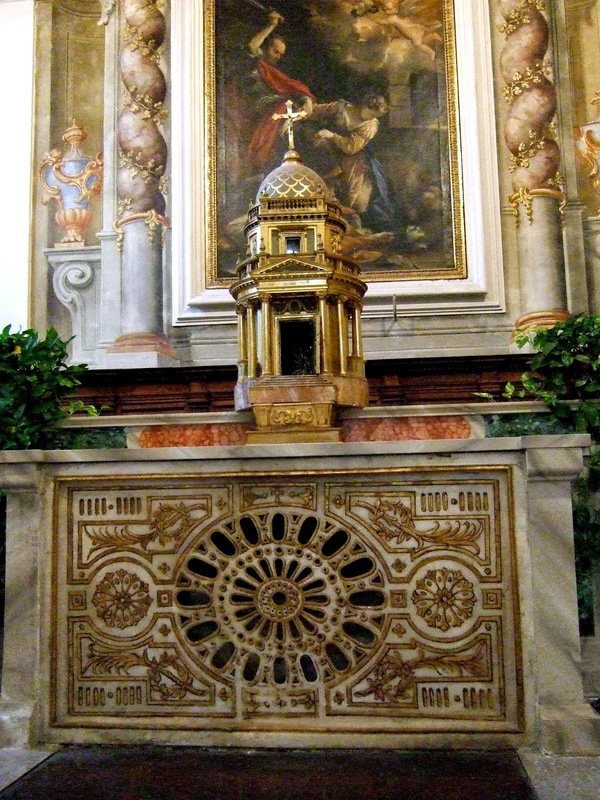 The term tabernacle to denote this kind of receptacle fixed to the altar for the reserved Sacrament was introduced by the reforming bishop of Verona, Matthew Giberti, about 1525 and his ideas were later endorsed by the Council of Trent. Further posts in this series will discuss each of these methods of Eucharistic Reservation. 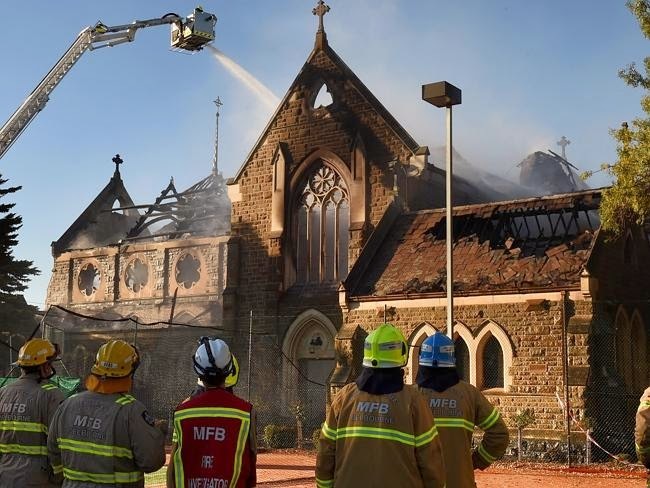 For this post, we have adapted essays in the Catholic Encyclopaedia (1911) by Father Herbert Thurston and in the Dictionary of Liturgy and Worship (1972) by Archdale A King. 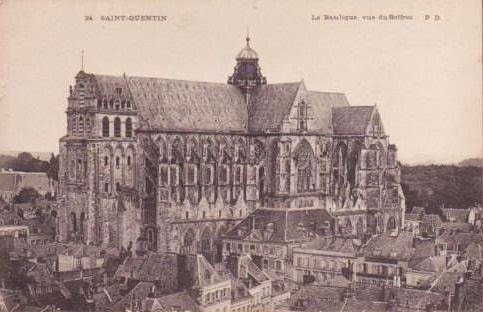 This early 20th century postcard shews a fine Gothic church in either France or Belgium. Its name and place are unknown. It is unclear as to whether it is a mediaeval church or of the 19th century Gothic Revival, but the presence of a Confessio immediately beneath chancel suggests something mediaeval (at least in part). Despite the ample proportions of the building, the chancel is relatively small and there are no quire stalls or other furnishings to suggest this is a Cathedral-church. 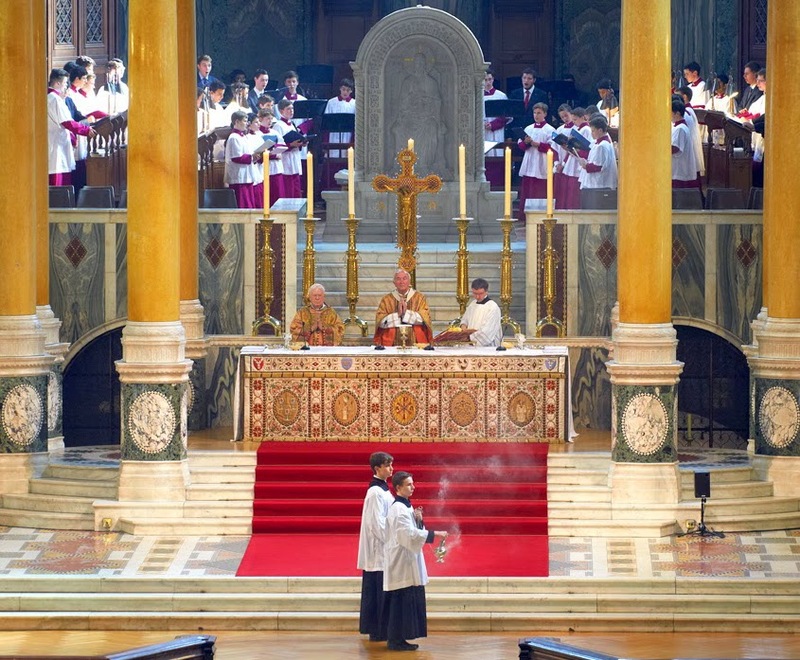 There is, however, a very fine civory or ciborium above the High altar. The Church of Saint Mary the Virgin, Hambleden. 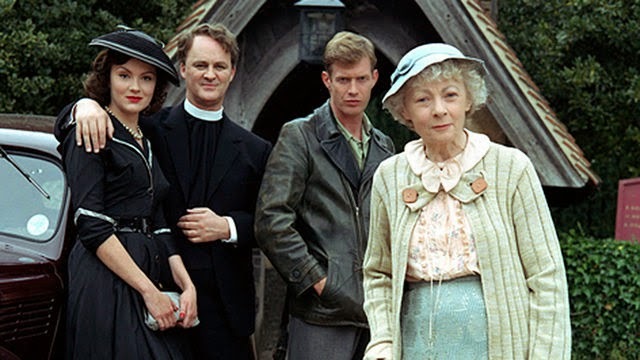 Devotees of BBC television dramas frequently see fine old English churches as a backdrop to the story. 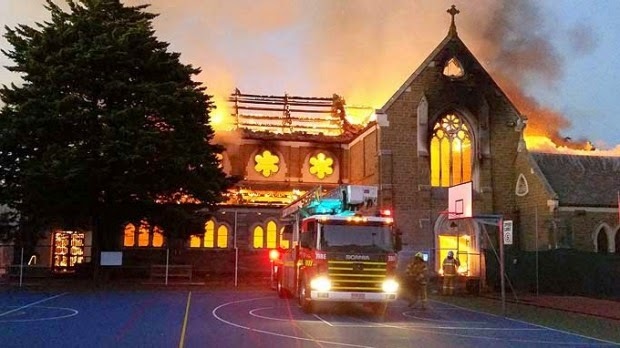 The writer of this column is often more interested in the churches than the storyline. 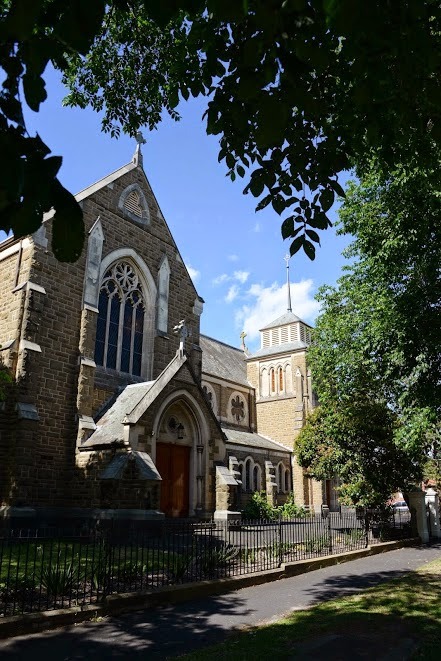 In some cases, such churches figure more prominently than others, as in a re-screening last night (Australia) of the 2004 production of Agatha Christie's Murder at the Vicarage. This novel is set in the fictional village of Saint Mary Mead and the famous amateur sleuth, Miss Jane Marple, lives opposite the church and vicarage. In this instance, the church exterior and interior depicted were two completely different buildings as, I expect, was the vicarage location. 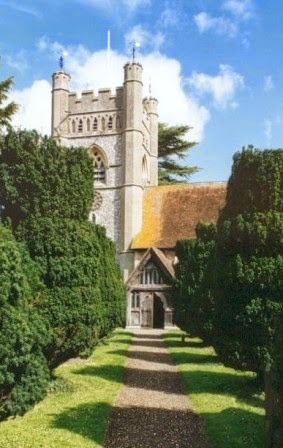 This post concerns that church outside which parts of the production were filmed, Saint Mary the Virgin in Hambleden in Buckinghamshire (UK). It seems that the church was used for another BBC Agatha Christie mystery Sad Cypress. doorway of the 14th century. 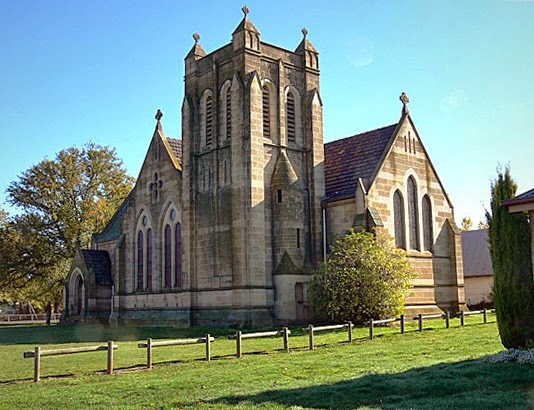 Like so many old English churches, Saint Mary's was built and rebuilt over many centuries and yet has a certain harmony of appearance because the same basic materials - flintstone and chalk with stone dressings - were employed at most stages of its development. It has its origins in the 12th century, as a cruciform building in the Norman style, but this basic plan was much altered in the two centuries which followed, so that Norman features are not immediately obvious from the exterior. 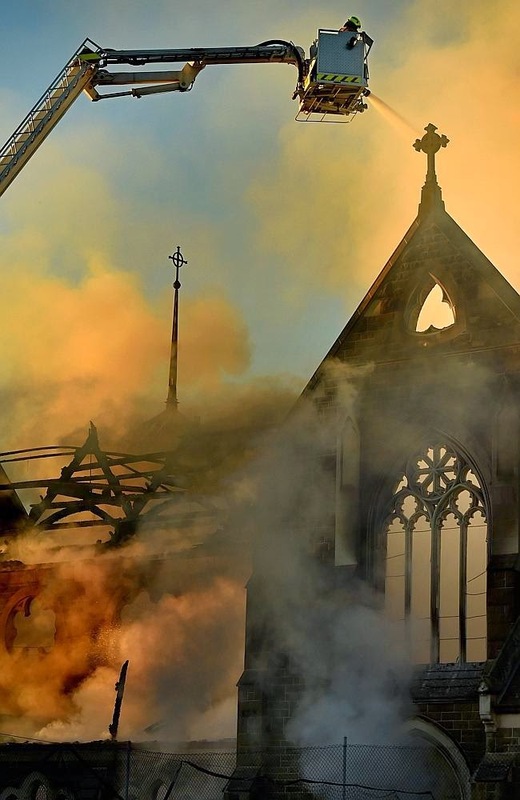 The church had a central tower over the Crossing which seems to have been part of the original building, but this collapsed and a new tower was built in a different situation at the west end of the building in the eighteenth century, and heightened to its present form in the late 19th century. The appearance of this tower, built when Gothic architecture was at its lower ebb, nevertheless in its simplicity complements the older work. 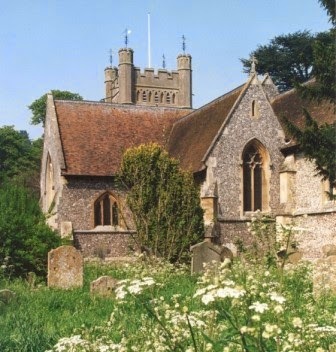 A detailed description of Saint Mary's Hambleden may be found here. View of Saint Mary the Virgin from the north east. The northern transept, although much altered, is the oldest part of the building. adjoins the transept. Also shewn is a small vestry. BBC production " Murder at the Vicarage ". They are standing outside the lychgate of Saint Mary's church.